Initially, this was a book that didn’t really grab me; Callum started out as an annoying and difficult character, whose actions and behaviours made no sense. Gradually, however, as snippets of the past were revealed (‘Before’), his attitude changed. I think about a third into the novel, I really started to enjoy it. I think Callum’s initial behaviour is necessary, as he grows a lot as a character through the book. The story was suspenseful and well-written – even though Callum’s day-to-day life living with his grandparents and attending a new school were mundane, I continued reading so that I could find out what it was that had changed his life so much and why he was sent to live with his grandparents. There are a lot of books in the teen fiction market with the premise of ‘A Big Bad Thing Happened and now everything has changed’. I think After pulled this off really well, without making it seem stale, and though I figure out the Big Bad Thing early on, there were so many other things that I didn’t see coming. This book felt distinctly Australian, and I really loved that. 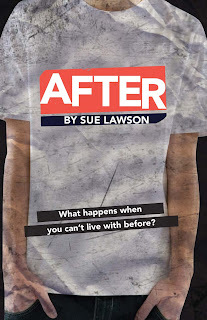 Overall a fantastically written novel, which I think teenagers will relate to, and which packs a powerful ending.